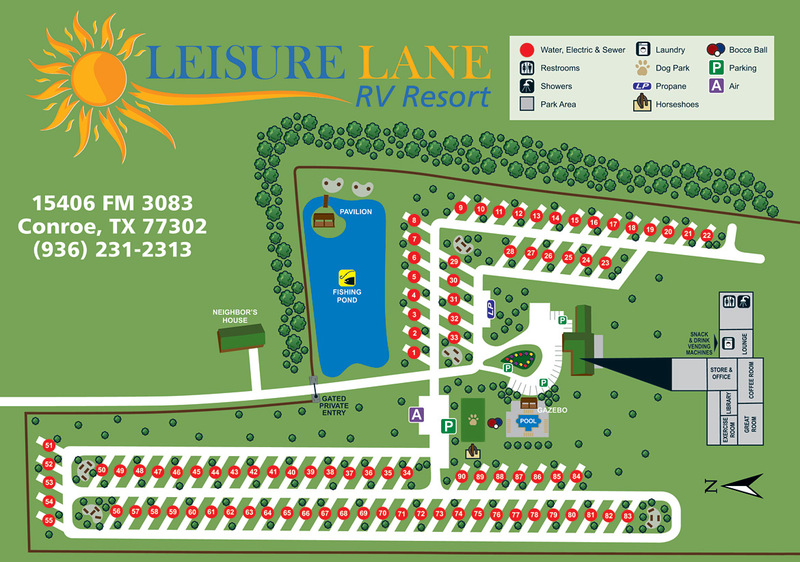 Welcome to Leisure Lane RV Resort! You have chosen on of the best RESORTS in Conroe, Texas. We cater to those who prefer higher standards of beauty, quality and safety for your family RV vacation. Our facilities consist of beautifully landscaped and well-maintained concrete sites. Our guidelines are strictly enforced to maintain these standards. Please familiarize yourself with these guidelines. Thank you and enjoy your stay with us! Office hours are 9:00am to 5:00pm Monday thru Saturday. Closed on Sundays and major holidays. Check-out time is 12:00pm. Check-in time is 1:00pm to 5:00pm. Special arrangements must be made for arrivals after 5:00pm. No RV arrivals after dark. Quiet Time: 10:00pm to 7:00am. High-profile exterior lighting on RV must be turned off by 10:00pm. No REFUNDS for early departure. All visitors must leave the resort by 10:00pm. Maximum overnight guests limited to 6 per RV site (charge of $6 per day – $50 per month per guest over age 4). Trash pick-up will be between 9:00am and 11:00am at the curb. There is a trash receptacle by the Clubhouse. No hazardous items including automotive betteries, paint, poisons or chemicals. All sites must be kept neat and tidy. A short cut across any other RV site is prohibited. No clotheslines, free-standing patio covers, or enclosures are allowed. Decks are permitted with management approval. Due to underground irrigation systems, no pegs, augers or stakes are permitted on lawns. Keep grassy areas free of all items so that lawn maintenance can be performed. All cooking devices must remain on the patio area. Open fires are not permitted. Portable propane firepits are allowed with management approval. O-Ring, donut or screw-in fittings for sewer connections must always be used. If your vehicle or RV requires service or mechanical repairs, please inquire at the Resort Office before contacting any services. No auto repairs or oil changes within the Resort. No screened-in rooms, canopies, tarps or window A/C units, RV must be self-contained. No exercise equipment, freezers, refrigerators or gas cans outside. Smoking is prohibited in all Resort facilities and public areas. Smoking is permitted on the guest site only. Please deposit of spent smoking materials safely and daily. Alcohol is permitted at your site only for those guests 21 years of age or older. No Alcohol is permitted in the public areas or Resort facilities. SPEED LIMIT THROUGHOUT THE RESORT IS 10MPH. RV Age requirement is 10 years old or newer and in excellent repair. RV’s over 10 years require management approval. No FEMA trailers, pop-ups, or tents are permitted. Limit of one RV and a maximum of two car/truck vehicles per site. All visitors must register with the office. NO PARKING IN THE STREETS, GRASS OR LANDSCAPING AREAS AT ANY TIME. NO PARKING ON VACANT LOTS. Bicycles, roller blades, skateboards, etc. must be used responsibly. No use of unlit vehicles after dark. No water toys are allowed in the pool. No glass containers of any kind allowed in the pool area. NO SWIMMING, WADING OR BOATING allowed in the pond. Fishing is catch and release. Discharging of firearms and fireworks are strictly prohibited. No open carry of firearms allowed. Anyone who willfully or negligently defaces, damages or destroys property/equipment of the Resort shall be liable for full-replacement cost. Disruptive noise, abusive language or conduct will not be permitted at any time. Extra Pets (more than 2) – $2 per pet, per day. All pets must be up to date on vaccinations. Proof of vaccination may be requested by the Resort. Pets must be on a leash and under control of the owner at all times. Pets may never be tethered outside or be left unattended or create a noise disturbance. Pets may be off the leash in the dog park but only with owner present. You MUST promptly pick up after your pet. A $20 clean up fee will be charged for pet waste left on site or not immediately picked up while walking pet. Waste bags provided throughout Resort. No pet pens or fences allowed on the grass. No pets allowed in the ponds, common buildings or pool areas except for certified “seeing eye” or personal assistance dogs. Ready to join Leisure Lane? © 2019 Leisure Lane Magnolia. All rights reserved.